Radiant Systems | Atlantic Refrigeration and Air Conditioning, Inc. When it comes to heating your home, many people would go with a gas furnace. Why? Simply because it’s popular, easy to install, and it gets the job done. However, some homeowners are looking for a different kind of heating system in Delaware. And in-floor radiant systems are about as different as you can get from a gas furnace! If you’re looking for something other than the standard furnace, then keep reading and discover why in-floor heating systems might be right for you. The autumn months are a good time to assess the current state of your heater and decide if you need a new one. If your current heater needs replacing, you might want to consider an alternative model such as a radiant heating system. It’s not right for every home, but older Bridgeville, DE houses that can’t support a traditional duct system could benefit from it, as can any home interested in saving a little money. Here’s how it all works. If you’re looking at replacing the heating system in your home, then now is an excellent time to do it. Fall has arrived, and with our chilly Dover, DE winters just a few short weeks away, you’ll want to equip your home with the best system you can to combat those low temperatures. And if more traditional forms of heating aren’t quite what you need, you might want to consider an alternative, specifically a radiant heating system. It involves placing tubes of coils beneath the floorboards in your home, then pumping heated liquid through them to warm your room directly through your feet of the furnishings. It sounds wild, but it actually provides a number of tangible benefits. Posted in Heating | Comments Off on What are the Benefits of a Radiant Heating System? 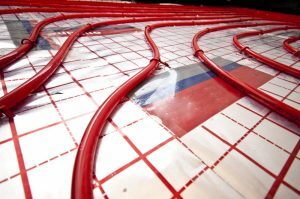 Radiant heating systems are comprised of cables or pipes situated between the subfloor and the floor surface. A central heating unit pumps hot water through the system, causing heat to radiate upwards through the floor and into the room. Panels can also be installed in the walls for the same purpose. Radiant heating systems have been around for a while, and are installed in homes all across the country. Why should you consider installing such a system, though? Read on to discover the benefits of radiant heating over traditional forced air. A forced air system works by taking air from inside your home, heating it, and then circulating it. Unfortunately, this means that the system is easily affected by the air quality around your home. If you have allergies, they can be exacerbated by allergens that have been trapped in your forced air system. Radiant heating completely avoids this by relying on water or electricity to transport heat. When a forced air system blows hot air into a room, the air rises to the top of the room and lowers as it cools down. This creates an unevenly heated environment, where the upper part of the room may be warm but the lower part is still quite cold. This can be very uncomfortable, especially when your upper body is warm but you still have to walk across cold floors. By comparison, a radiant system transmits heat from the floor to the objects on top of it. These objects, like couches and chairs, then transmit that heat to the surrounding area. This causes the air itself to remain at a fairly constant temperature, while keeping you warm as you move around and sit on furniture. As much as 30% of the energy devoted to heating is lost in forced air heating systems. This is often due to leaks in the ducts. Radiant systems, on the other hand, deliver almost all of their heating energy to the rooms in the house. This makes it far more efficient than forced air systems, saving you money on your utility bill. If you are thinking about installing a radiant system in your home, call Atlantic Refrigeration today. No matter where you are in Georgetown, our experts can help you!